By now you all know the dirty little secret that most pumpkin spice lattes and syrups have dairy in them. But did you know most of them don’t even have any pumpkin in them at all? The pumpkin spice refers to a blend of spices you use in pumpkin pie. My other pumpkin latte includes real pumpkin, so I thought I needed to make one with no pumpkin too. This recipe is especially for those of you who are not pumpkin-in-your-coffee kind of people. Now everyone can revel in pumpkin spice season! 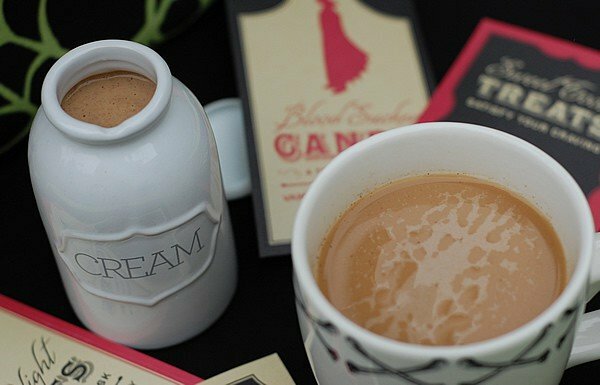 Making your own creamer is a very fulfilling thing to do. It’s not very hard and you can tailor every flavor to your personal dietary requirements and tastes. Use the sweetener you prefer – right now I’m on a coconut sugar kick. It tastes similar to brown sugar, but is looser like regular granulated sugar. You could also use stevia, agave nectar and of course plain old sugar if that’s what you prefer or have on hand. 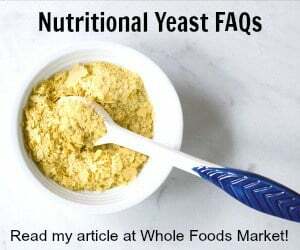 Cashews are a nice neutral nut to use as your creamer base but you could use almonds or anything else you can make your own non-dairy milk from like oats and rice. 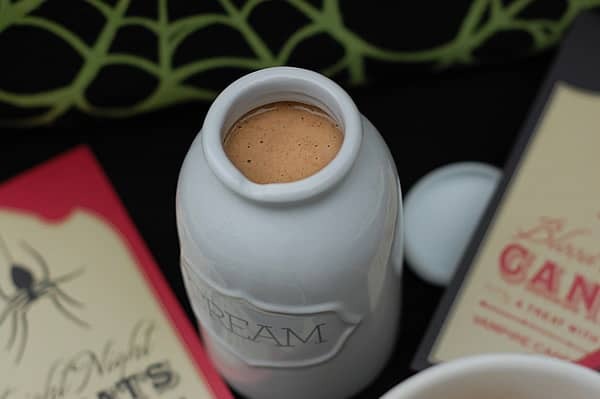 Please note: when you add a dollop of creamer to your coffee it will look separated, but don’t worry once you give it a good stir it will incorporate. In a small 1½ to 2 quart slow cooker add cashews and cooking water. Cook 8 to 9 hours on low or 3 to 4 hours on high. Alternatively you can cook them on the stove in a small saucepan for about 20 minutes over medium heat. Once you drain the water (I find that the water gets a little murky, so I like to drain the cashews and add fresh water to blend into the creamer) add the cashews, 1½ cup water for blending, sugar and spices. Store in the fridge for up to 7 days. Looking for more Halloween recipes? Get my ebook, The Ghoulish Gourmet. Get the Kindle version at Amazon for $5.99. Vegan Pecan Pumpkin Shake – No Ice Cream Needed! Love the mug! I have yet to try coconut sugar. Great time to try. Thank you for the recipe. Love making cashew cream. I love all things Halloween! Me, too – it’s my birthday! Thanks so much for these vegan options to fancy latte drinks! Coconut sugar is the best! It reminds me of brown sugar. Great idea. I’m going to use some of mine in a Halloween parfait! This sounds amazing. 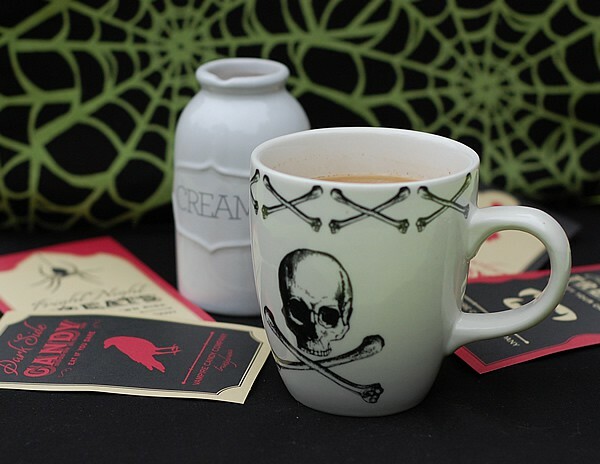 I’m really REALLY diggin’ the Skull & Crossbones mug, need one bad! i made this yesterday and am enjoying it right now. I actually did it wrong (i think) i cooked all the ingredients together and then she i said to drain the cashews i knew i should not lose the yummy juice it was cooking in and made my house smell wonderful. I added the 11/2 cups of water and then i tasted it- good, but i also added the cooking liquid back – DELICIOUS!!!! what a wonderful yummy treat. 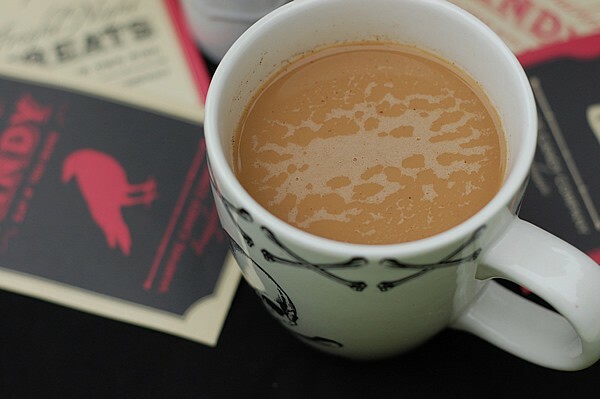 THe coffee is smooth and creamer- you would never know it was nuts (though i use almost milk in my coffee now so maybe my taste buds are accustomed to no dairy). i have now purchased one of your cookbooks and am on my way to get the other one. i am a converted slow cooker! Can I make this with less or no sugar? Will it still be good for 7 days with less or no sugar?